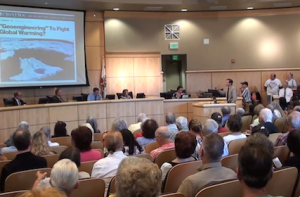 GEOENGINEERING (CHEMTRAILS) INVESTIGATION DEMANDED BY NUMEROUS EXPERTS | "Global Possibilities"
On July 15th, 2014, citizens from Northern California rallied to create the largest attendance ever at the Shasta County Supervisors chambers (400+, chairman Les Baugh confirmed this attendance record at the start of the meeting). The primary purpose of this meeting was to present information that proves there is a very dire heavy metal contamination and UV radiation issue across the Shasta County region (and the world). A list of 10 experts presented data to the board to confirm the legitimacy of the concerns being addressed. At the end of the presentation, the board voted unanimously to investigate the heavy metal contamination and passed resolutions accordingly. The video below documents the events of this landmark day in the fight to expose the crime of global geoengineering, all experts are identified with labels in the video (the new edited, condensed version). Here in youngstown Ohio its been raining alot, you can still see the spraying going on, the formless clouds that don’t look at all natural, I have many flowers in my yard even wild flowers still seen only one bumble bee and strange bee that looks like a honey bee,this is a disaster people should be freaking out by now, this is a quite war against humanity people should be talking more about jailing all who had a hand in this.I keep my photos and film for proof, will start testing water and siol soon, documenting trees all around town.If I become too sick the only thing I want is these people to go to jail no money unless my wife and kid gets sick, my wife already shows symptoms of heavy metals.